MORRISTOWN _ As the wife of a military man, Melissa Anderson is accustomed to being on the move. Anderson expects to leave Picatinny Arsenal and be living in Jacksonville, N.C. by May of 2013. That means the bout held Saturday, Dec. 8, 2012 was her last one with the Corporal Punishers. Anderson, known as Heinz Catchup and wearing No. 57 when on the flat track at Inline Morristown, was excellent in her New Jersey roller derby finale, helping power the Corporal Punishers past the Happy Valley Dolls of Pennsylvania, 247-114. "I love this," said Anderson, who has been a jammer with the Corporal Punishers for three years. "It's a little sad. Being involved with this is great. It's addicting." Her passion for the sport was on display versus the Happy Valley Dolls. Anderson, whose husband, Joseph, is a sargeant, piled up points, many of them in power-jam situations while the opposing team's jammer sat in the penalty box. Over and over, Anderson, the mother of two young children, broke through the pack. It didn't matter that she was still recovering from the flu. All Anderson wanted to do was find an opening and battle her way past the Dolls, including Blackout Betty. The Corporal Punishers pulled away in the first half courtesy of two lengthy bursts of points. One run was 20 points. Another was 14. It was close after the initial 10 minutes. By halftime, the Corporal Punishers had built an 81-51 lead. 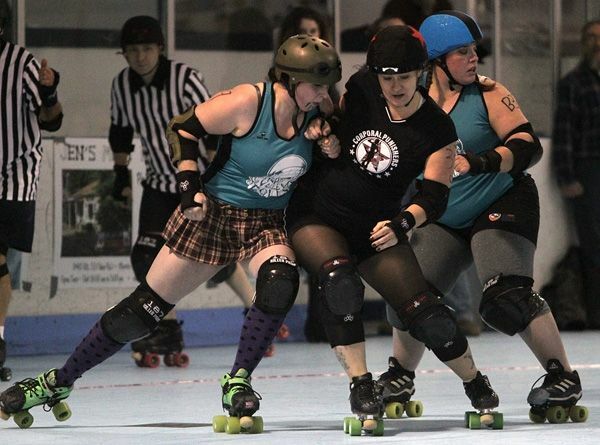 "She's one of our best jammers," said bout MVP Doom Hilda, also known as Sandy Obringer, of Anderson. It's no wonder Anderson has such deft moves on the track. Some of it, no doubt, stems from her being a track standout at Monroe Township High School and at Middlesex County College. Anderson specialized in the 100 and 200 meters and gained All-America honors while in college. Roller derby has been a major part of her life for the last few years. "This was a good way for me to be on a team," Anderson said. "You meet a lot of people. I needed to get out of the house and this got me working out. It's really exciting." And, it's not over, either. Anderson has plans to wear the colors of the Eastern Carolina Brawling Betties once she gets to her next home. Easthell Getty, aka Jillian Mueller of Blairstown, will be taking a leave of absence next season so she was pushing extra hard, too. "Winning tonight means a lot because I'll be taking a break," Mueller said. "We won together as a team. That's a big deal for us." Mueller, inspired to put on skates after seeing the movie "Whip It," certainly did her part, aiding the jammers and playing strong defense. Obringer, normally a blocker, was called upon to be a jammer for the first time in four-plus months because the Corporal Punishers had only 12 skaters instead of the usual 14. "I was fine with it," Obringer said. "I can do it obviously. I took one for the team. When you block, that makes you a better jammer. You know how to move and block." She scored several of the home team's final points. Next season, Mueller noted, the Corporal Punishers will have some good "fresh meat," the term for new skaters. "We're building them up," Mueller said. "They're getting a lot of personalized attention. It's a good learning experience."